percentile_disc – Java, SQL and jOOQ. percentile_disc(1.0) WITHIN GROUP (ORDER BY film_id) AS "100%"
This is not surprising, as the IDs are just consecutive values, which is a desired property of surrogate keys. percentile_disc(1.0) WITHIN GROUP (ORDER BY amount) AS "100%"
When plotting this, we can see that there are more amounts in the lower half of the range than in the upper half, which leads to percentiles growing slower. percentile_disc(1.0) WITHIN GROUP (ORDER BY length) AS "100%"
So, the GROUP BY clause produced one row per rating, and an additional grand total column at the bottom. 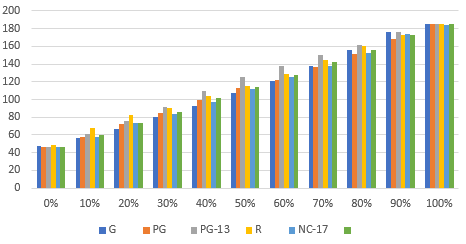 For illustration purposes, I’ve added the COUNT(*) column, to show how many films are in each group. The 5 first rows sum up to 1000, which is again the grand total at the bottom. We can “see” that there is no strong correlation between the two data points. 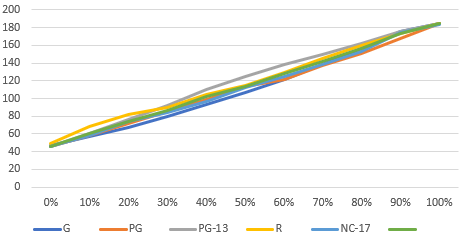 Both data sets are close to uniformly distributed, quite independently of the rating, with the exception of PG-13, which is just slightly skewed towards longer film lengths. Again, this isn’t terribly interesting as the data set was generated, probably using some randomness to avoid perfectly uniform distribution. In real world scenarios, the above data would have been more “skewed”. How does this help with performance? A balanced tree index is very useful when data is quite uniformly distributed, because in that case, it can help access data points or ranges of data in O(log(N)) time. This is quite a useful property for queries that look for film_id values, e.g. An index on the amount column could have been useful for the second query, but maybe not for the first one. Dates and timestamps (there are always some peaks, e.g. end of month, end of year, during daytime, etc. Also, the business might grow over time, so there is more “younger” than “older” data). Note, a large source of “skew” in dates and timestamps can be caused by encoding them using a wrong data type. Don’t store dates as strings! This article has shown how we can use simple SQL aggregate functions, including the percentiles, to calculate and visualise such “skew”.